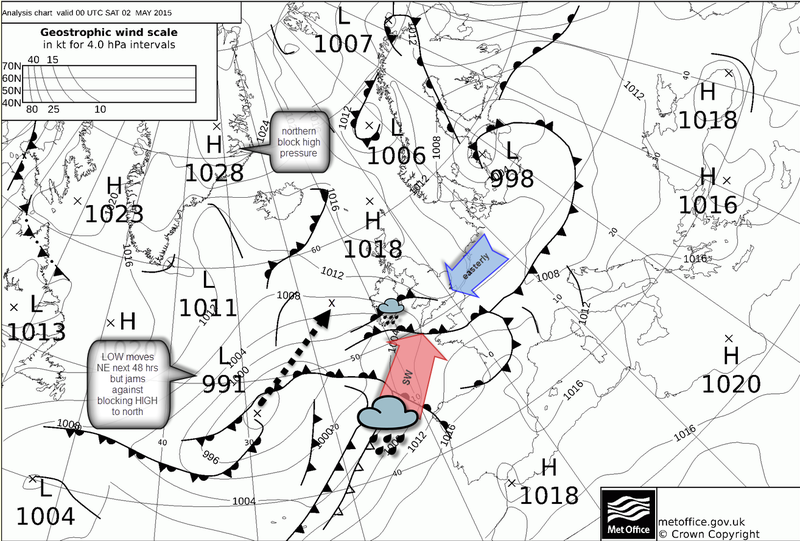 The analysis chart above shows a weakening ridge of HIGH pressure over the UK being edged out north by a slow moving Atlantic LOW to the W/SW. Reigate is still currently (Saturday am) in cool dull easterly winds generated by the HIGH but a significant switch in wind direction will take place over the next 12 hours into the bank holiday period as a wholly different mild and humid Sub-Tropical Atlantic air mass, with a source region round the Azores, takes hold from the SW.
A mild moist S/SW wind drives in from the Atlantic as the LOW edges north east tonight. The first mass of rain is edging onto radar from the SW and is expected to arrive in Reigate by around mid-late pm today. Most rain is likely for places further north and west but the SE is still likely to pick up plenty of wet weather overnight with low cloud and rain into Sunday morning when it could turn heavy and showery for a while in the early morning as the trough passes directly overhead and pressure continues to fall. Things are expected to clear to brighter conditions later in the afternoon as pressure rises and winds turn more westerly. Cloud cover will hopefully break and cloud height will lift during the afternoon becoming more cumuliform. If the sun comes out then there could be a low risk of an odd heavy shower Sunday afternoon, possibly thundery, but these are more likely further north of our area where more unstable air makes progress across the Midlands and East Anglia. During Sunday winds will be occasionally blustery with moderate convective gusts possible, especially on hills and nearer the coast, and make the mild temperatures Tmax 16C feel considerably cooler. Temperatures overnight could hold up to a balmy 12-13C. Winds turn from SW to more southerly through Monday and pressure should up-tick slightly giving a mostly dry and warm day and less windy as things stand currently. 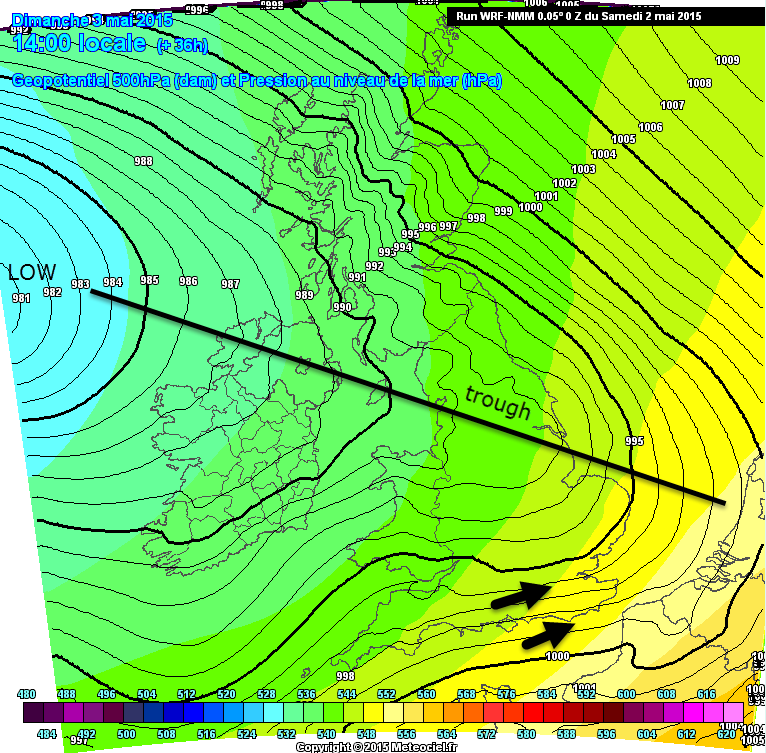 Troughs could progress east during Monday and build cloud and produce some showers. More importantly there is a looming threat of something special for later Monday-Tuesday night. As the northern block (high over Greenland) holds on, the Atlantic LOW just west of Ireland will usher in a mild and moist S/SW flow of air from the continent. An unstable LOW brewing in the topical Atlantic today (Saturday) is forecast to sweep up and intensify from Biscay later Monday and into Tuesday and this might bring heavy rain and winds to the south and SE and a possible thundery episode later Monday but more likely overnight into early Tuesday for SE. The jetstream is dipping well south and is forecast to perk up and approach the UK from an unusually southerly direction by Tuesday. If this happens the jetstream could deepen this low considerably, as modelled by some charts (latest UKMet shows 980mb). Depending on the evolution we could find ourselves in the unstable left exit region of a jet where divergence aloft enhances convective action and creates heavy rain. Warm air from the south will also contain more moisture. A dry slot at mid-levels might also enhance instability (rising dry air cools more quickly increasing lapse rates and CAPE, enhancing lift). High dew points near the surface temperature also encourage condensation and indicate extremely moist warm surface flows. So all these ingredients stirred up could be a good recipe for some briefly moderate-severe weather in our region especially some briefly torrential rain, though totals are unlikely to amount to more than 10mm. 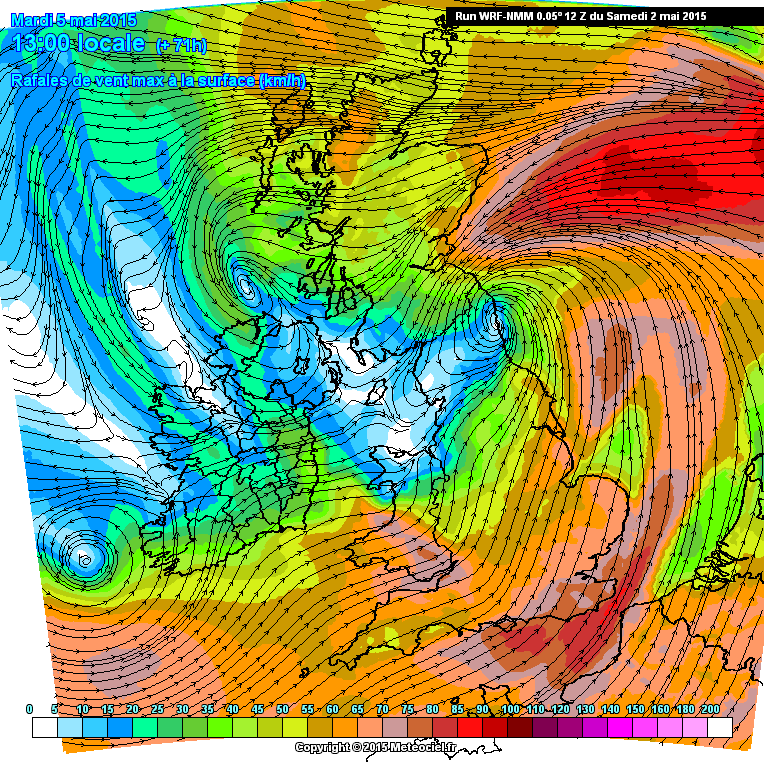 Gusty winds and gales near coasts could also accompany this system. Latest metoffice chart shows pressure dipping to 980mb in the North Sea which is significantly LOW pressure for the time of year. However these episodes have a habit of tracking across Holland and merely clip Kent with thundery showers and miss us entirely. Models also generally exaggerate these early on and then things flatten out nearer the time considerably. Nevertheless, it is worth watching this develop as our first potential “warm plume” of the year. If we take a direct hit the SE could have some heavy rain. 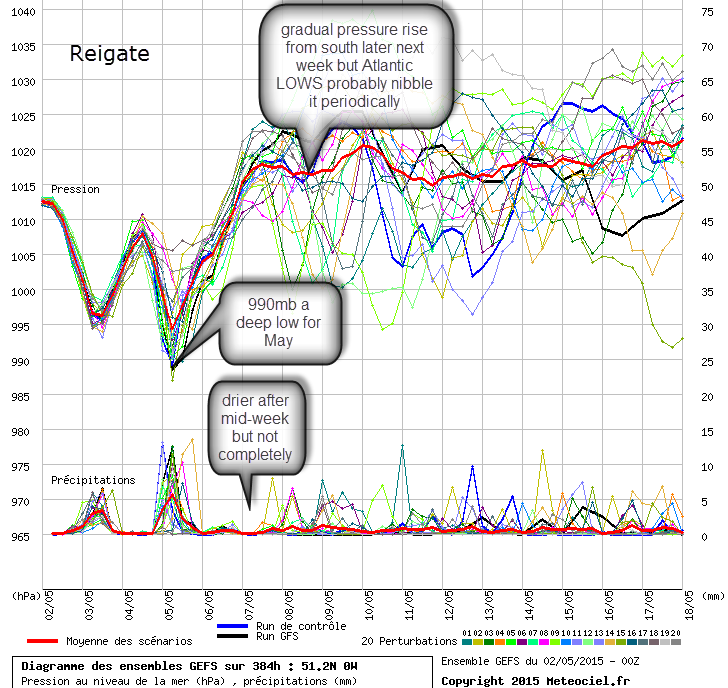 The GEFS summary below clearly shows the two main rainfall spikes tonight and Monday night. 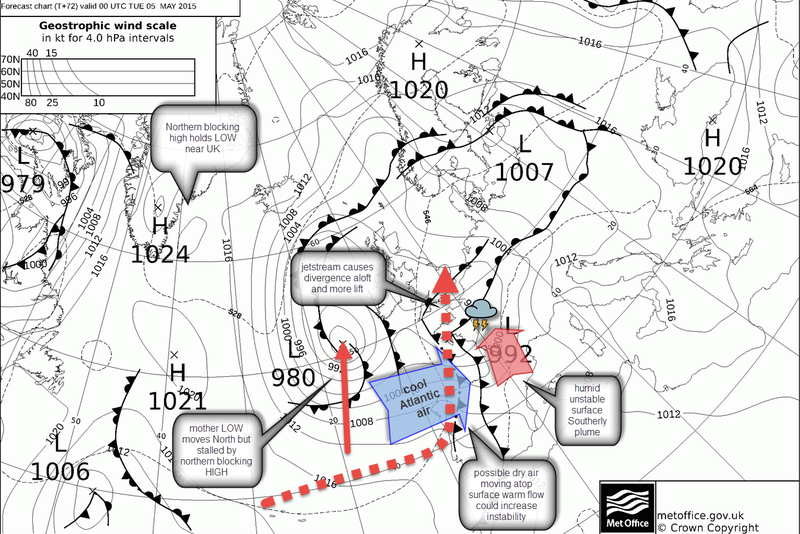 Later mid-week the LOW is expected to drift east across the UK bringing in a more westerly pattern so unsettled showery weather is likely for a while. Thereafter, a rise in pressure from a developing Euro high pressure may then take place from the south and settle things down for us in the SE, though this might only make faltering progress. Hope you enjoyed this post. Comments are always welcome. Links to websites used to create our blog posts can be found on our links page. 1. Watch out for… highly unstable cool air moving off the Channel onto warming surfaces during the daytime leading to convection, cumulonimbus clouds and heavy showers, maybe risk of thunder and hail over Reigate: especially Monday and Tuesday. April showers in a cold March? 2. Keep an eye on … the big show-down between the powerful Polar North Easterlies spilling out from huge blocking HIGH pressure over the Arctic and the, so far, rather feeble South Westerly maritime air that has made little impression recently. They are due to have a face-off on Thursday. The leading edge of fronts might be snow…but will the warm air reach Reigate or will the LOW retreat out into the Atlantic? 3. You can’t see this in the sky but… note the off-the-scale negative Arctic Oscillation graph that indicates a weak jetstream and high pressure over the Pole which allows Polar air to flood out over the UK easily. 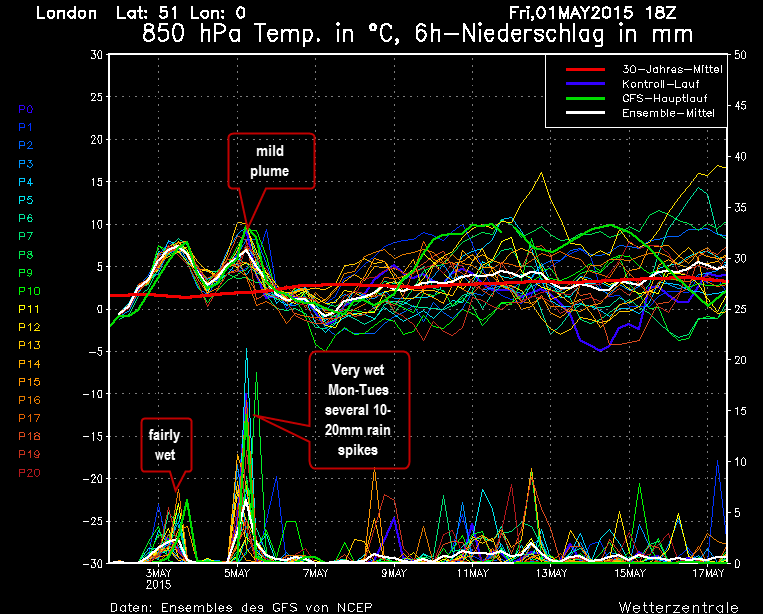 Will this mean another fake start to Spring this weekend (check the temperature graph leaping up at the weekend!) and then a return to cold next? Reigate will mostly stay on the “warm” side of this LOW and avoid the very coldest easterlies this week which will stay up north (except mid-week which will be cooler down here) but the cold air will never be far away so frosty nights are certain, cool temps in slacker winds are definite, heavy showers hit and miss and a minor risk of snow anytime are still worth watching for! Hope you enjoy the week weather watchers! 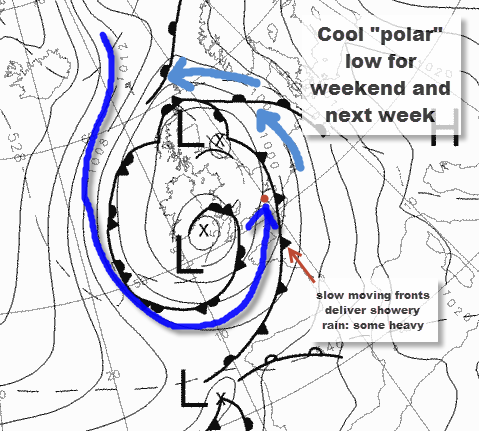 quick update Monday: cold weather continues to next week… polar easterly winds return Monday-Tues. after warmer spell this weekend but poss SNOW preceding warm front Saturday- update later. Heavy rain with snowfall/sleet poss in between for SE: on weds, thurs & Fri. Very active, very odd, potentially extreme weather…watch this space for updates. So, for the moment the Easterlies win! some are calling this the MIA: Mini-Ice Age! quick update Weds: snow threat Fri/Sat as Atlantic fronts on a vigorous depression move in from the west and move up against the cold air. 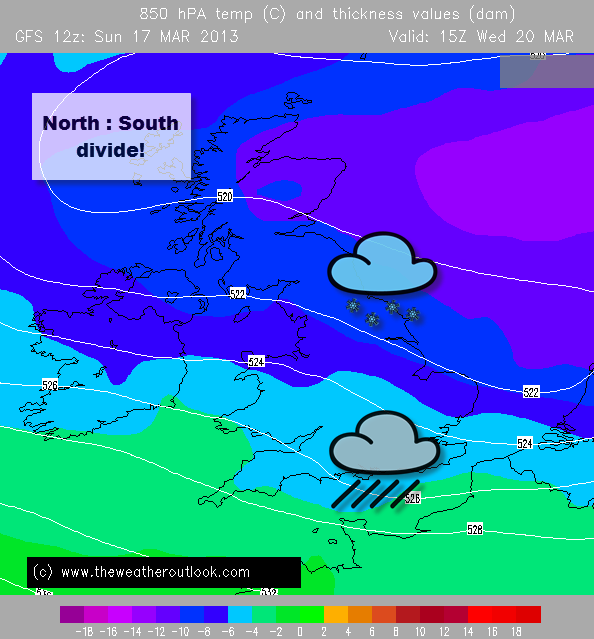 This may dump snow on Reigate Saturday. 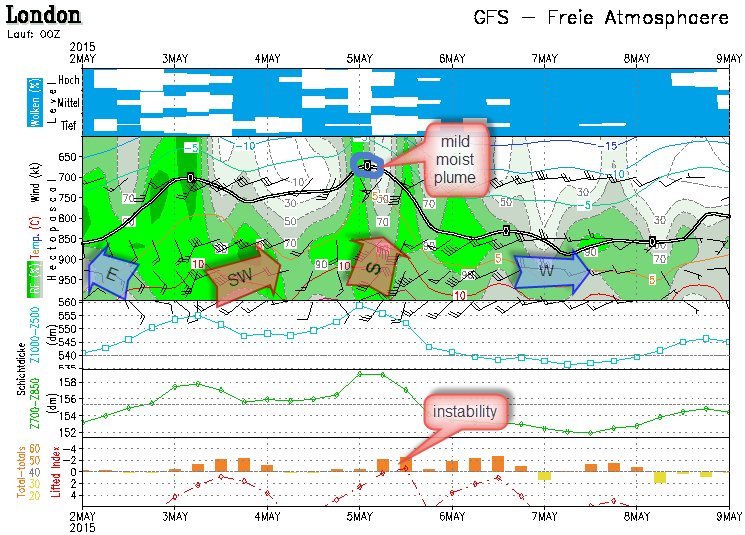 Next week looks COLD … back in the freezer high threat: snowy Easter possible. NOT the start of Spring by any stretch…someone tell those birds. New LOW reaches Reigate over the weekend: becoming depressed and unstable! A cool LOW pressure tracking across from Greenland and Iceland will move over the UK on Friday and sit over Reigate for the weekend and into much of next week. Atlantic depressions usually have some warm tropical air circulating with cold polar air but not this one! With high pressure to the west any warm SW air flow is being blocked out, leaving Reigate on a “cold-washing-cycle” with mostly swirling cold polar air circulating around the low. Cool air coupled with low pressure even in this cool Spring weather causes unstable airmasses. Instability means that big showers can develop as thermals rise from warming surfaces even in the weak Spring sunshine we are experiencing. Convective thunderstorms are a remote but interesting potential risk for Reigate over the weekend. Various fronts and troughs will circulate around the LOW pressure which is blocked by a HIGH over Scandinavia and E.Europe and won’t move much. The LOW will bring showery rain, some of it heavy with the possibility of hail and even thunderstorms, especially over the weekend (50% chance of convective thunderstorms on Sunday over Reigate). Temperatures will never climb much above 7°C and, with gusty winds of over 30mph, it will feel cool, but nothing like what we had earlier this week. Some models predict a return of cold Easterly winds as the LOW slips south over the UK and drags in cold continental air again. There is still uncertainty about this but it will certainly be an unsettled week. Other models see glimmers of spring after around the 23 March as winds turn more SW and a ridge builds over the country bringing drier conditions. More on this later, keep your fingers crossed!